This simple Linear circuit provides continuously variable regulated current (~25-400mA) from a 4-6 Volt source. I chose a linear design for simplicity, reliability, ease of repair, and to avoid switching EMI in my Cave Radios. The circuit requires only 0.2V headroom above the parallel LED Array voltage to provide regulation at maximum current. The headroom stays low until the LED's are extinguished at about 0.75V/cell for 4-cell packs. End of life for alkalines is usually considered to be 0.9V/cell. My HDS 24-LED array requires 2.9V at 25mA and 3.5V at 440mA. The circuit can be scaled for larger or smaller arrays, and should actually handle several Amps with a larger heatsink. With 4 AA Alkalines, life should be 3 hours (or more) at maximum setting for a 24-LED array, but ~60-80 hours at minimum setting, which is bright enough for many activities, including reading, if the mounting bracket allows the lamp to pivot downward like mine does. In a two week test, I found that the white even light made caving easy. 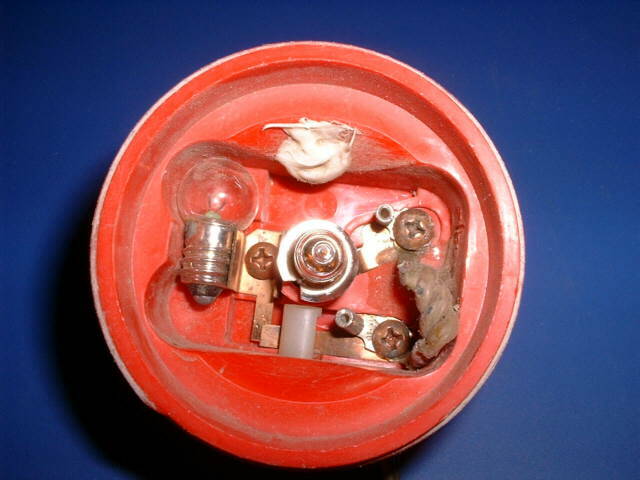 The "rings" and sharp cutoff of halogen lamps are absent. I found that I could usually get away with 200mA when moving, and much less when stationary (surveying, resting, eating), getting up to a10 hour trip from 4 AA's. The real beauty of white LED's is that the light remains white even at the lowest settings, compared to halogen light which shifts rapidly to infrared when dimmed. The battery pack can be 4 AA, C, or D size Alkaline, Ni-Cad, NiMH, 1.5V AA Lithium cells, or a 6V Lead-Acid. 3-cell C or D Alkaline packs should also work, but they will not be discharged as deeply. "Dead" cells from Halogen lamps, GPS, etc., should give hours of "free" light at lower current settings. My latest pack is two 3V, 8AH lithium cells removed from a military surplus BA-5598/U battery (5 cells/battery). These are available from Fair Radio Sales at http://www.fairradio.com at 2 for $6.50 plus shipping. 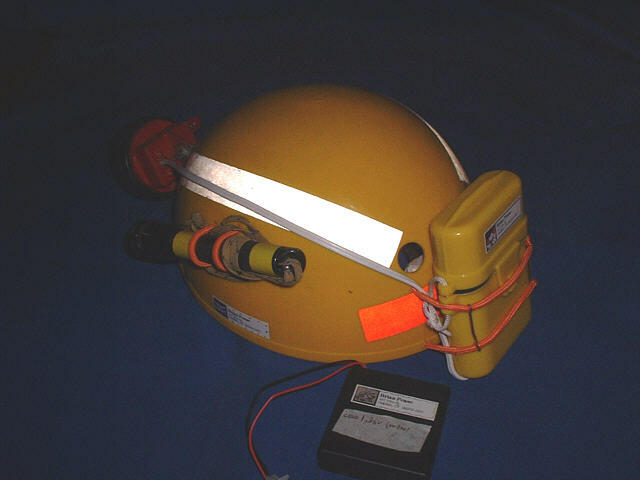 My headpiece is an old waterproof "Easter Seals" Lexan "Roosa" light with a rocker on-off switch. See http://www.lightingpro.org (under construction), but you can call them directly (860-728-1061 in CT) or email sales@lightingpro.org. The red model HL-4AA with a 4AA pack on its headband is $20. All the parts are available separately, including the headpiece, battery packs, and replacement lenses. They also sell a complete headlamp with halogen bulb (and spare) with Willy Hunt's microtroller switching voltage regulator (not suitable for LED's) for $55 retail, but maybe at $45 if you are worthy. Because I am lazy, I purchased a 24-LED parallel array from Henry Schneiker of HDS systems at http://www.hdssystems.com or 1-877-437-7978 (toll free). If you are a caver, he might be willing to sell you enough LEDs for a light at reasonable cost, but remember that they must be matched for this parallel array. The Nichia LED's have a 20 degree half power beamwidth with significant sidelight, which seems ideal. The simplest and surest way to get premium Nichia LEDs is to order directly from http://www.nichia.com . The part number is NSPW500BS (20 degree, 6800 mcd, 5 mm dia, flange). The cost is $2.05 each for a quantity of exactly 100, plus $8.00 for prompt shipping. Smaller quantities are way too expensive, and you need to sort them by voltage drop (at 20 mA) from a larger batch anyway. 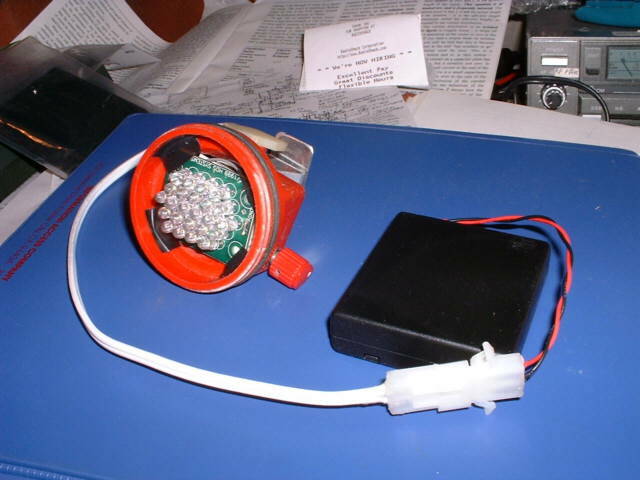 See Garry Petrie's "Perfect LED Light" at http://home.europa.com/~gp/perfect_led_light.htm for detailed technical info on white LED's and a simple way to assemble an LED array on a do-it-yourself circuit board. He shows how to install arrays into Petzl Micro and Mega headlamps using switching regulators. However, the regulators themselves are constant voltage rather than the desired constant current, and are the lamps truly submersible? An excellent Website. 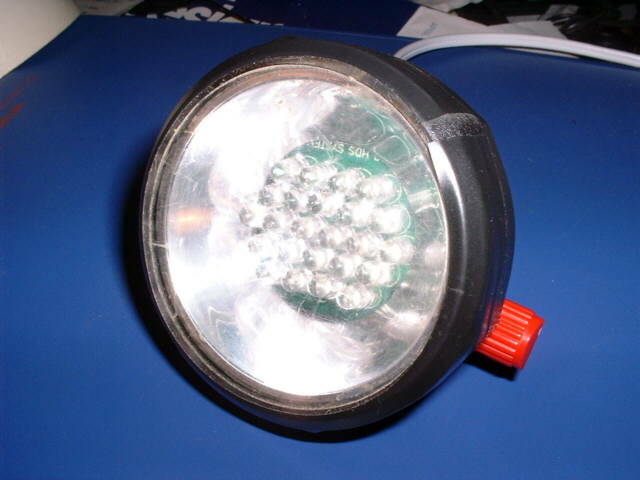 Another resource is the LED Flashlight Page, http://www.uwgb.edu/nevermab/led.htm. See Ray Cole's Website, http://members.cox.net/k4gaa/caving.htm, for info on a 24 LED light using a series-parallel arrangement to nearly eliminate matching, and an efficient dimmable switching regulator. I used a commercial array because of the careful voltage matching required in order to obtain anywhere near equal light from each LED when they are wired in parallel (and avoid overheating at full power). I would have to had purchase a large quantity of LED's to solve this problem. This was expensive, but was the only real cost. The MOSFET current source can be any N-channel enhancement mode unit designed to be driven by "logic level" signals. It must fully turn on at 400mA with Vgs<3V. Beware of static electricity on the gate of this unit! I destroyed the IRLZ34N used in the breadboard when I soldered it into the actual unit. A small 1" square of sheet aluminum serves as a heat sink. Dissipation is about 0.9 watts at maximum current with a true 6V worst case source. R4 samples the LED current. Voltage drop is 0.2V at 400mA. If a much larger or smaller array is used, R4 should be adjusted to give ~0.2V drop at maximum array current (~20mA/LED). Q1, D2, R3, and R6 form a simple "single supply" op-amp that can sense the voltage across R4 nearly down to zero volts. The forward voltage drop across D2 is nearly identical to the base-emitter drop of Q1, thus the voltage between the arm of R2 and ground is the same as the voltage across R2. D2 provides nearly perfect temperature compensation for the dimmer control, which becomes very critical at the dimmest settings. R5, and D1 provide a regulated voltage for the dimmer control R2. This voltage, about 0.5V, is not temperature compensated, but is not critical in this design. If R2 is set to max current, 0.2V will appear on the base of Q1. The collector current of Q1 will be momentarily be cut off, which will turn on the MOSFET. The voltage across R4 will rise until it reaches 0.2V, giving an array current of 400mA. Q1 will then turn on, regulating the array current. R1 is the only critical part. R1 must be chosen to provide the desired maximum array current at the maximum setting of R2. The drop across the LED array is ~3.5V at maximum current. As the batteries die, the drain-source voltage of the MOSFET gradually drops to zero, and regulation is lost. The lamp will gradually dim, but the MOSFET will stay locked ON, with the only wasted power being the drop across R4. Dimming the lamp will bring it back into regulated mode for a while. This circuit extracts nearly all of the energy in the battery pack, down to 0.75V/cell for a 4-cell pack. The ~25mA minimum array current results from slight differences in the forward voltage drops of D2 and Q1. If desired, replacing D2 with the base-emitter junction of a second 2N2222 should reduce the minimum current to ~zero. There are variations of this circuit such as one by my namesake Bob Pease in the Sept 5, 2000 issue of Electronic Design Magazine using a voltage regulator and a BJT. Another variation uses a real low voltage single-supply op-amp in place of Q1 and either a BJT or MOSFET. 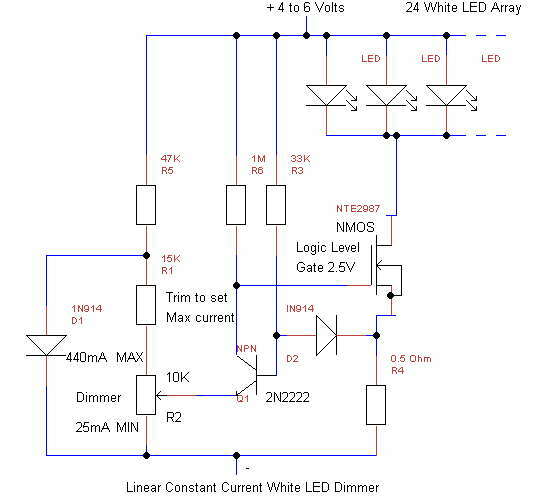 This circuit should work well as-is with a 1 -Watt Luxeon LED, but it has not been tested. Calculate a new value for the current sense resistor R4 to give 0.2VDC drop at your maxium array current. R4=0.2/max current (Amps). Momentarily connect the array, the MOSFET, and R4 in series across the power source (a variable supply recommended for safety), with the MOSFET gate tied directly to the positive lead of the power source. This will give the maximum possible current for your specific MOSFET, array, and battery voltage. The voltage drop across R4 can be used to measure the current. If the maximum current found in 2) is sufficient, then the circuit can probably be made to work. It might be necessary to lower the value of R4. First,I breadboarded the entire circuit in order to test the design and set the maximum current limit. Next, I "hogged out" the interior recess of the Lexan Easter Seals headpiece with a Dremel Tool, and also removed uneeded metal from the switch contacts. The 1/2" dia pot was positioned as far to the rear as possible so that the knob (1/8" shaft) would clear the lens when the lens was screwed on. 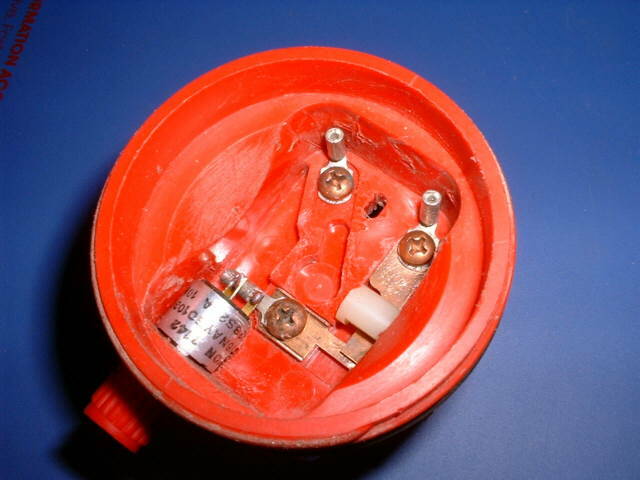 Point-to-point wiring was used for the regulator, without a circuit board. Everything was installed as far to the rear as possible to allow the TO-220 MOSFET to fit over the circuit with a flat aluminum heat sink cut to fit into the recess. Stranded hookup wire was used to make the 3 connections to the MOSFET. Spacers of Index card paper were used above and below the MOSFET to prevent shorts. The LED array sat on top of the recess, resting on its 4 corners. 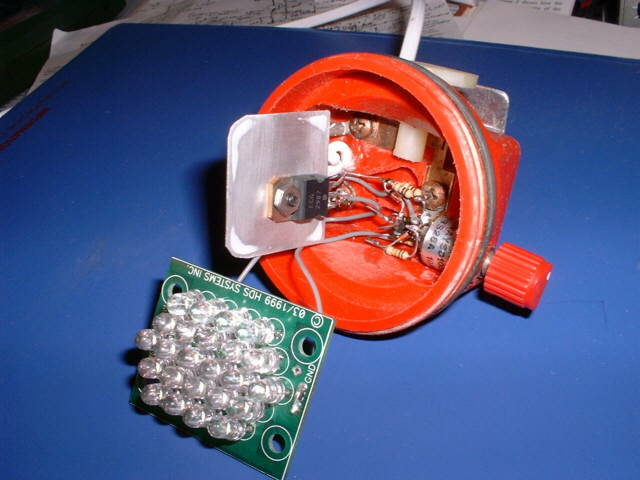 A large hole was cut in the plastic reflector, by slicing off the back, to clear the LED's on the arrays' circuit board. The main purpose of the reflector is to hold the LED array firmly in place when the clear lens is screwed on, but it actually does direct a little light forward and besides, it looks cool. 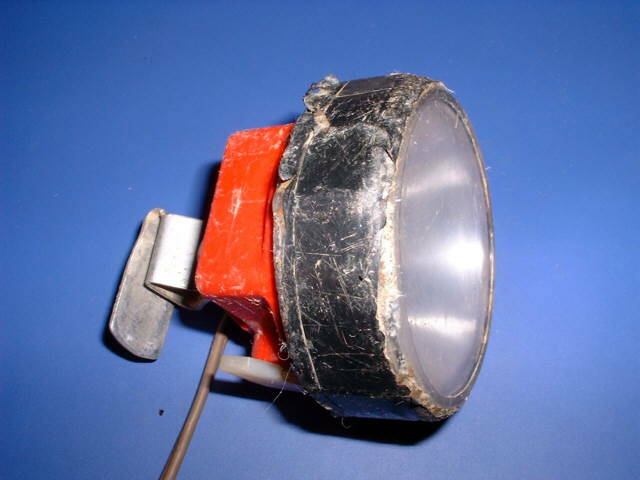 Black electrical tape was wrapped around the flange of the lens to keep direct light out of the users eyes. Calibration marks were melted into the housing to calibrate the dimmer knob every 100mA (1,2,3,4). Water must be kept off the circuit. Specifically, water on the high-impedance MOSFET gate line will cause the array to go dim until the circuit is dried out. I used silicone rubber over all the wiring. 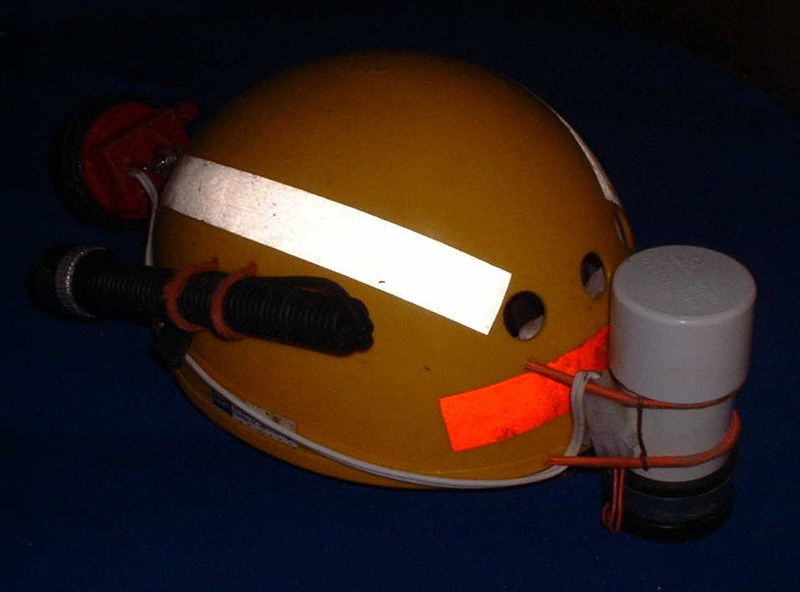 I installed a $1.00 watertight swimmer's "dry" container on my helmet to hold the Radio Shack 270-409 battery pack. There is also room for 4 spare AA cells, although I simply bought 2 spare packs at $1.50 each and installed $.99 Molex connector pairs (274-222) which also allow use of the original Easter Seals Lexan belt-clip battery case, which holds 4 Ni-cad 4-AH D cells soldered together for a really long trip.